BlackBerry Storm Application Center | BlackBerry Blast! Check out the BlackBerry Storm's Application Center. These screen shots are from a Vodafone BB but the Verizon version shouldn't be much different. 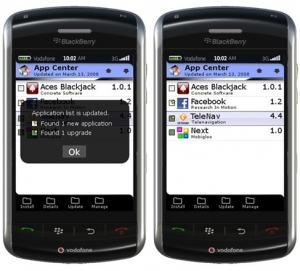 The Application Center will be available on version 4.7 BlackBerry Storms. The carriers will be responsible for hosting the data and updates.